This is one scarf that is used all 4 seasons. They are very popular around the fashion world. If you would like to look with the latest fashion style, this is one scarf you must have. Get them now and look great, all your friends will ask you about it. This classic Houndstooth design square shawl will bring a burst of color to any ensemble. It is a fashion must have for this season and any season! 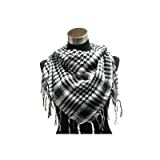 Make a fashion statement wearing this light weight comfortable 100% cotton, hand woven scarfs. The Shemagh or kafiya is a traditional Middle Eastern head wrap thought to have been developed from the Arabic turban. Its primary purpose is to protect the wearer’s head, face, eyes, and neck from the elements, including the sun, wind, dust, and sand. It can also be worn around the neck as a scarf, and lately has become a popular fashion accessory. Adopted by the British Special Air Service (SAS) personnel during World War II, the woven cotton scarves are popular today with coalition forces operating in Iraq and Afghanistan. All of our shemaghs are 100% cotton and the colors are woven in as opposed to printed on the surface as is the case with some cheaper (and inferior) products. Approximately 42″x42″. 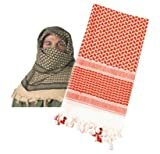 This listing is for a Red and White shemagh. We offer both traditional and tactical colors in our eBay store. If you do not see the color you want, contact us and we will list it for you. This cool brick red and black kafiyah, or traditional Arab scarf, measures 42 inches by 42 inches, made of woven cotton, the kafiyah has knotted tassel ends, and a soft feel. It can be worn as a head scarf or around the neck. 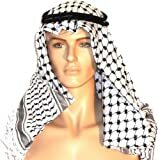 These popular head coverings are also known as: keffieh, keffiyah, keffiyeh, kufiyah, kaffiya, kafiya, gutra, hatta, shemagh, Kafiyah, ghutra, gutra, hatta, kaffiya, kafiya, mashada, shemagh, or Arab scarves. The kafiyah is brand new, never worn.